After years of harrassment by masked thugs, there’s a new trend in the countryside: mask up and hit them back. In this film, two cars carrying hunt saboteurs are rammed by an off-road vehicle. Dash-cam footage shows a dark blue Toyota Land Cruiser, with its numberplate obscured, slamming at speed into the side of the saboteurs’ parked car. The driver then reverses before ramming a second car, also carrying anti-hunt activists. The sabs say their car was written off and one person suffered minor injuries. They were planning to disrupt the Grove and Rufford Hunt, meeting at Newark, Nottinghamshire, when the clash happened. Following the failure of prosecutions of hunt staff under Tony Blair’s 2005 Hunting Act, saboteur organisations have been trying to incite violence from hunters in order to film it. This discredits hunting and is a fundraiser for the sabs. This film shows an angry farmer driving at a hunt saboteur with his quad bike – while shouting “get off my land”. Violence erupted in October 2018 as West Midlands Hunt Saboteurs in black balaclavas tried to disrupt the Atherstone Hunt. The farmer, dressed in green John Deere overalls, drives a quad bike up to three men and shouts at them to “get off my land”. He then jumps off the bike before pushing one of the sabs, who fell into a ditch. These are desperate acts by country people against animal rights activists, many out for the day from cities, who are inspired by media they see and read, and have little understanding of or connection with the countryside. The BBC is in the vanguard of sab promoters. In March 2019, it made a new promotional film for hunt saboteurs that recalls the filming style of an Isis or Daesh recruitment video. The BBC Inside Out West team joins a group of saboteurs determined to disrupt a hunt in Monmouthshire, and ambushes a hunt enjoying a day’s trailhunting. The BBC uses footage filmed while trespassing on farmland. The new BBC film follows a film made by BBC Three TV in 2018. This BBC documentary legitimises and glamourises hunt saboteurs. BBC Three joins a group of masked thugs and makes them look good. The ‘balance’ comes several minutes in to the half-hour film, when pro hunters are given a chance to make the point that people dressed as terrorists, scaring horses and leading hounds on to roads is not reasonable behaviour. A BBC film crew is caught trespassing on farmland with a radical saboteur that they admit has a string of convictions for violence. With a BBC film crew among them, these sabs try to behave and leave their baseball bats at home. At the end of the documentary, the BBC presenter admits that the hunt is doing nothing wrong. A pattern emerges of BBC journalists joining hunt saboteurs, giving airtime to the sabs’ arguments, providing sympathetic and often glamorous images, and then ambushing hunters, sometimes from among crowds of masked saboteurs. In the same week as the BBC Three film, in 2018, online vlog channel Unilad released another well-produced recruitment video for animal rights activists. In one scene, Grampian Hunt Saboteur and Wildlife Professional Kevin Newell said: “I think everyone would be shocked if they knew what really went on in the countryside… The violence already is horrendous down there – in England, in Wales.” Newell has previous convictions for intimidating hunt supporters in 2016, here reported on the BBC and in The Herald, and back in court in 2017, reported here. He has also disrupted shoots, reported here by Police Scotland. Thanks to viewers for sending in these links. One Fieldsports Channel viewer, who was there, claims Unilad faked part of its report. Read his comments here. Antis have since posted names and addresses of hunters that took part in some of these documentaries in order to incite violence against them. The hunt saboteur movement has gained pace in recent years, thanks to backing from organisations including BBC and funding from cosmetics shop Lush. The BBC provides positive coverage of hunt saboteurs and makes ‘sabbing’ fashionable. Mark Constantine, founder of Lush, is a keen fundraiser for hunt saboteurs. Led by the BBC coverage, the UK media looks favourably on the hunt saboteur movement, with stories supporting their actions reported as wildlife protection successes. Seldom do media outlets report the wildlife conservation benefits of hunting and shooting, nor mention that almost all wildlife in the countryside is managed by hunters and shooters. Where local newspapers used to post details of hunt meets and hunt balls, now they post details of anti-hunt demonstrations. The stated aim of hunt saboteurs is to prevent hunts and shoots from taking place. It does this through violent intimidation, trying to interfere with hounds, horses and the normal practise of hunting with hounds. 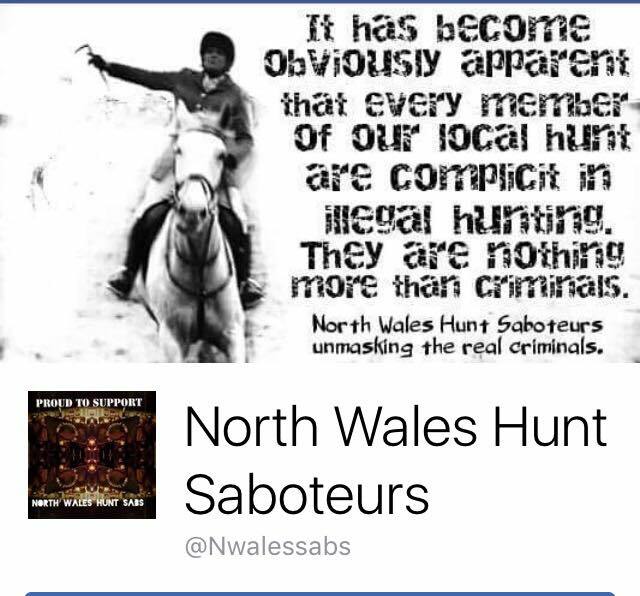 Groups of sabs, often with little understanding of the danger they put themselves in – as well as the danger to hounds, horses and hunt followers – try to interfere with hunts. A school in England has cancelled an event with a local hunt after children received death threats from antis. The Leadon Vale Basset Hounds were due to make their annual visit to the Elms School in Herefordshire to show the children trailhunting. The school uses the meet as an opportunity to educate the children about hunting and the polarising debate around the issue, allowing them to make informed decisions. The school postponed the day after an online campaign by violent animal rights activists. Hunt sabs in balaclavas frightened women and children at the Ashford Valley Tickham Hunt in Kent in 2017. Police were called to Hole Park, Rolvenden, after masked hunt saboteurs approached two female riders, one an 11-year-old girl riding her pony, and a 22-year-old. The saboteurs, dressed in black and wearing balaclavas, shouted at the riders in what appears to be an attempt to spook the horses. No arrests were made. See full story here. In 2017, a group of hunt saboteurs turned a fox into the path of hounds with their “screaming and shouting”, a court was told in March 2019. At the trial at Ipswich Crown Court, huntsman Christopher Amatt was found guilty under the 2004 Hunting Act, becoming the first member of an organised hunt to be convicted under the act for four years. Only a handful of people have been convicted, and only pre-2015, when the RSPCA provided payments to their lawyers of £300,000+ per trial. Codefendant Archibald Clifton-Brown was cleared of the offence after a three-day trial. Both the men were found guilty of assaulting hunt saboteur Steven Milton when he grabbed a dead fox as evidence of hunting in Great Thurlow, Suffolk. The men were involved in a ‘tug-of-war’ with the fox carcase. Amatt was fined a total of £250 and ordered to pay £600 in costs. Clifton-Brown was fined £150 and must pay £450 costs. The Countryside Alliance promises the convictions will be appealed. Hunt saboteurs may have chased a foxhound on to a busy road where it was hit by a car and killed. The Fitzwilliam Hunt was trying to turn hounds back from the A14 dual carriageway. However, footage shot by Cambridgeshire saboteurs shows them chasing the hound on to the road, where they filmed it being killed by a car, and then released the film to news agencies blaming the hunt. Hunt staff can be seen desperately trying to turn the hound back from the road. The PR stunt by antis that ended with the death of a hound has led to hunt staff considering wearing cameras so they can show extreme sab action like this in the future. Hunt saboteurs steal hounds and hold them captive. This hound called, appropriately, Drama, was returned to the Crawley & Horsham Hunt after hunt staff reported the animal missing to police. Local hunt saboteurs held the hound for four days, causing stress to both the kennel staff and the hound. A police force warned the public not always to believe what they see and read on social media about fox hunting. Cheshire Police says that, “frequently, video footage does not reflect the full scenario”. In a carefully worded statement, Cheshire Police revealed how the propaganda war waged by anti hunt activists and huntsmen and women on websites like Facebook is often “based on inaccurate information”. The move comes after Cheshire Hunt Saboteurs posted edited video footage online of violence against a protester during a hunt. But after detectives saw the entire clip and wider context they decided to not pursue prosecutions. Antis say they feel ‘alienated’. Grouse moor sabs feel legitimised by media outlets that monster gamekeepers. The RSPB is campaigning against gamekeepers for widespread poisoning of raptors, an editorial line that is accepted without question by most broadcasters. Fieldsports Channel viewer Jeff Smart wrote to the BBC in March 2019 to complain after BBC Breakfast News ran a story on the persecution of hen harriers including two representatives from the RSPB, who claimed that gamekeepers were killing birds of prey, without asking for a response from the shooting organisations. Among other actions, the Animal Liberation Front claimed it vandalised this butcher’s shop in Kent in 2018. The family that owns the shop removed the graffiti with hairspray. Often, hunt saboteurs attack the wrong target. Antis protesting against fox hunting burst into a pub and left customers and staff upset after swinging a dead animal. However, in one case in 2017, it looks like North Wales Hunt Saboteurs chose the wrong pub. The landlord of the Fox & Barrel pub posted the following on Facebook: “At no point, has any staff from the Fox & Barrel nor our family supported this cruel blood sport. This protest left the staff and customers extremely upset .The police were called but the group left before the police arrived.